There are a number of requisite ingredients for any successful RPG campaign; one that engages the players as well as the game master. The best scenarios and adventures are the ones that totally immerse all of their participants in the gaming environment. They make the game come to life, ensure that the players characters become fully formed extensions of themselves and allow everyone involved to escape, for the briefest of moments, the limitations of the real world and become everything that they ever wanted to, and thought they could be. Everyone who has ever picked up a D20 knows how addictive, how compulsive and how enjoyable it is to be given free rein and the power to completely control your own destiny. 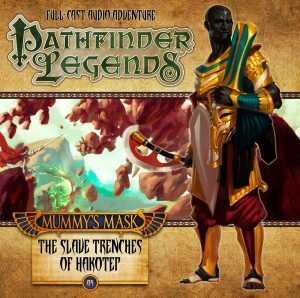 It’s intoxicating, regardless of the gaming system or setting, and this latest series of Pathfinder Legends replicates all of those feelings and the same raw, nervous excitement and enjoyment that gaming does, as the audience feels like they’re actually there alongside Ezren, Valeros, Merisiel and Harsk. Whether it’s the magic of the incredible and all-encompassing sound design, the immediacy of the characters’ interaction, the way they become entangled in the story, the multi-layered plot, or a combination of all of those factors, The Slave Trenches of Hakotep makes you feel like you’re actually there. It makes you feel like you’ve been transported to Golarion, almost as if you’re in the thick of the action, fighting alongside the brave adventurers, helping them to solve the clues and riddles and (for the most part) to avoid the traps and pitfalls that are part and parcel of their increasingly dangerous daily lives.